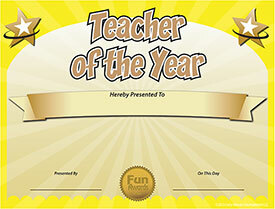 In celebration of Teacher Appreciation Day, we are giving away a FREE Teacher of the Year Award certificate template. You can type directly onto the certificate template before printing. 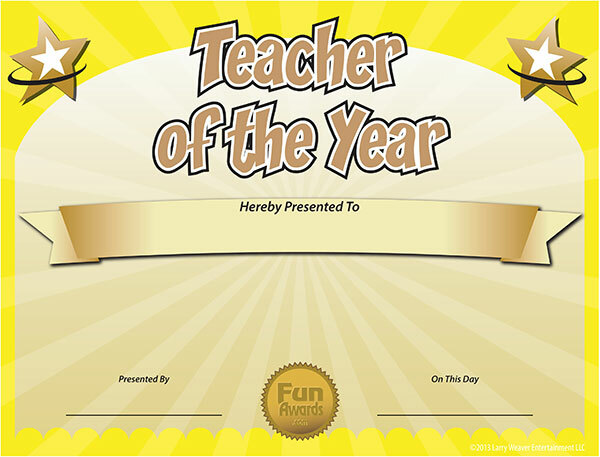 Within seconds you'll have a unique award that will bring smiles to your favorite teacher! Just click the link below to download the PDF and enjoy! For inspiring me to achieve my greatest potential. For your hard work, dedication, and patience. You deserve a raise. But for now, this free award will have to do! If you like this free Teacher of the Year Award certificate template, we only ask that you please click the "ShareThis" button below and post this page to Facebook, mention it on your blog, or email it to your friends. Our employees love to receive these certificates. We use them for weekly incentives to boost moral and add a chuckle!